I was commissioned to make this watch, the customer wanted something warm and almost plum like. Its made with sterling silver chain and Silver charms and lots and lots of crystals and beads. I finished it off with a black stain bow. 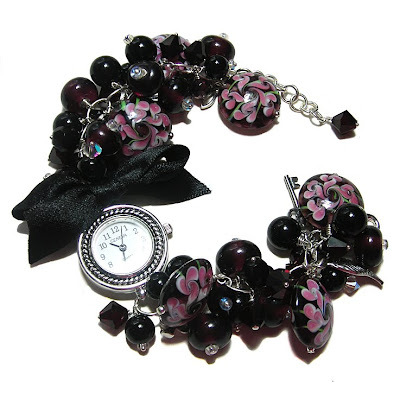 I love this bracelet so much and it reminds me that I must make one for myself some time! As soon as I made it I knew what it had to be named... Mulled Wine of course! By the way I had a great time at the Skunk Anansie gig on Tuesday. Mark has blogged about it if you're interested. Just click here. Very swish watch! Like it. The gig sounds great - Skin's outfit is fabulous! oh it's all Victoriana decadence. Fab!